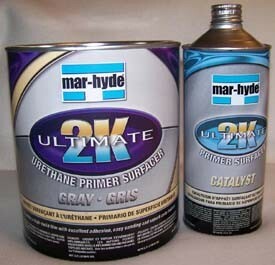 Kit includes: 1 gallon of Mar-Hyde 5563 BUFF/Chamois/Vanilla Ultimate 2K High Build Urethane Primer Surfacer and 1 quart Mar-Hyde 5557 2K Ultimate Catalyst. NOTE: This item is non-compliant with California VOC state laws and can not be shipped anywhere in the state. Orders processed will be automatically refunded.